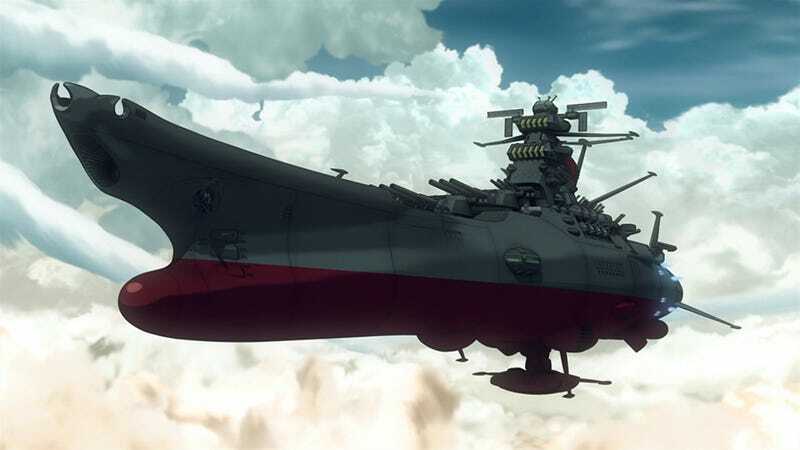 Space Battleship Yamato (Starblazers in the West) is one of the cornerstones of anime. Created by Yoshinobu Nishizaki and the legendary Leiji Matsumoto (Galaxy Express 999, Captain Harlock, Daft Punk's Interstella 5555), it is the original space opera anime and has had a prominent place in Japanese popular culture for nearly 40 years. With the success of the live-action film in 2010, production began on a new Yamato anime series, the first in over 30 years. But Space Battleship Yamato 2199 is not your ordinary anime. Rather, it is a full 26-episode series that is airing first in Japanese theaters and later on TV. This is far from a regular occurrence. Normally, an anime is produced, aired on Japanese TV, and then released on DVD/Blu-Ray. If it is popular enough, the anime will often get a movie that is either an abridged version of the series or a sequel to it. Yamato 2199 is, for all intents and purposes, the opposite. About every two months, two-to-four episodes of the series are premiered in select theaters throughout Japan. Those who attend these showings are able to buy exclusive, first-run DVD/Blu-Ray copies of the episodes they have just watched. Those same DVDs/Blu-Rays are then released to the general public around a month later. A TV airing of Yamato 2199 wasn't even officially scheduled until less than month ago. But why make an anime series like this, so opposite the traditional model of anime production? This is because the upfront cost for making an anime is much higher in the traditional model. You see, in Japan, television networks do not pay the cost of producing a new anime—that is all left up to the production studio (and the conglomerate of sponsors it gathers). This means that it requires a massive amount of money upfront to launch a new anime series. Because of this, back in 2010, Bandai decided to skip TV production altogether by putting out each episode of its new Gundam series, Gundam Unicorn, in theaters throughout Japan. Then, each 50-minute episode was released as an OVA shortly thereafter. Yamato 2199 simply takes the Gundam Unicorn model and goes one step further by making a full 26-episode series and getting it onto network TV after reaping the Blu-Ray and movie theater sales. And since Yamato 2199 will be hitting Japanese TV this April, this first try at a new model of production for a full 26-episode anime appears to be a clear success. But success or no, only time will tell if Yamato 2199 is remembered as a trailblazer in anime production, or just an interesting footnote in the annals of anime history. Space Battleship Yamato 2199 episodes 1-10 are currently available on Japanese Blu-Ray with English subtitles. A new set of four episodes comes out roughly once every two months. It will begin airing on Japanese TV this April.